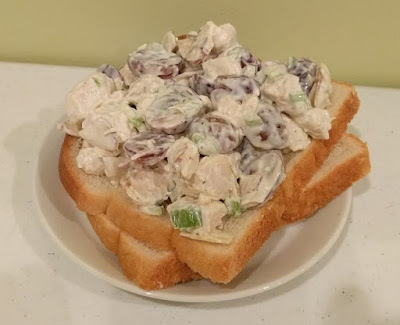 I have't posted a recipe recently, and as I was enjoying my Chicken Salad Sandwich tonight, I thought, "Hey! Why am I being so greedy? I should share this delicious recipe with everyone!" This is a great quick recipe to make for lunches or dinner. You can serve it on a sandwich, in a pita, or on a bed of lettuce. Heat oil in small skillet and cook chicken cubes until done. Meanwhile, mix remaining ingredients in a bowl. Stir in chicken and enjoy! Super quick! And easy clean-up. You only need a small skillet, cutting board, and bowl. You can eat right away or chill in the fridge. This keeps in the fridge for several days and tastes just as fresh and delicious as the day you made it!